i Click 'view all' to instantly compare this ok deal with offers on other top butter dishes. 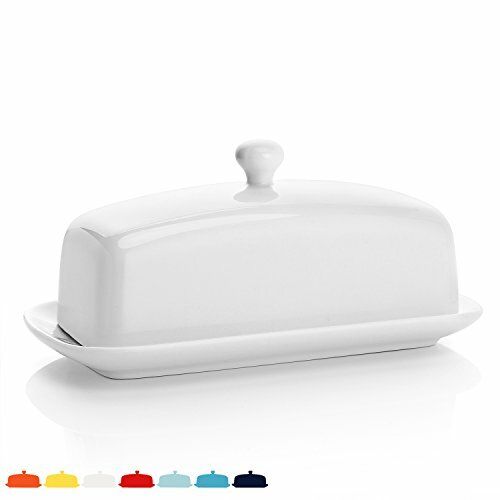 Sweese 3156 Porcelain Butter Dish w/ Lid, White is currently selling at $16.99, which is its normal price. It has a lowest price of $16.99 and is selling within its usual range. Price volatility is 0.15% (meaning it does not change often), so you might have to wait a while for the price to drop. Until then this is a recommended 'ok deal'. There is a coupon available for an additional 10% off. The current deal is also the best price on this item over the last month. Compare the current price, savings (in dollars & percent) and Buy Ratings for the top Butter Dishes that are closely related to Sweese 3156 Porcelain Butter Dish w/ Lid, White. Here is how Sweese 3156 Porcelain Butter Dish w/ Lid, White compares with other leading Butter Dishes. Why Choose Sweese Butter Dish? 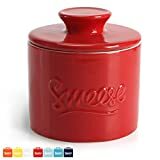 Advantage Of Sweese Butter Dish - Helps keep your kitchen looking tidy and organized, keeps the pet out of the butter. A Little Knob - Has a little knob on top making it easier to take off the lid, prevents from slipping out of your hand should you get butter on it. A Good Raised Border - There is also a small ridge on the dish so that the butter stays in the middle of the dish and there is less of a chance of dropping the lid on to the edge of the butter. Perfect Size - Big enough to allow the butter breathing room. You can fit one stick of butter in this dish easily without having to worry about butter touching the top or sides of the lid. FeaturesPERFECT BUTTER DISH - Beautifully simple style, the white is a timeless look that matches any decor. Good weight, clean, upscale appeal. Has a lip that keeps the butter from sliding around and keeps the pet out of the butter. Helps keep your kitchen looking tidy and organized.WITH HANDLE&RIDGE INSIDE - Elegant radius of the curved edges. Has a little knob on top to lift the cover allowing you to gently place your hard butter inside and cover it with ease. There is also a small ridge on the dish so that the butter stays in the middle of the dish and there is less of a chance of dropping the lid on to the edge of the butter.ADEQUATE CAPACITY - It fits a full "American size" stick of butter. Sweese also makes the top taller and wide enough. 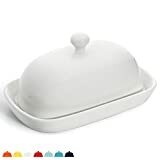 You can fit one stick of butter in this dish easily without having to worry about butter touching the top or sides of the lid.ALWAYS LOOKS GREAT - Plain white makes it go with a lot of dish patterns. Easily keeps it clean, dust free, light out, and dishwasher safe. Takes up very little counter space, perfect butter dish if you have a small space or if you don't want to keep a lot of butter out.